There is a whole lot of information on the web about ACME leadscrews and the anti-backlash nuts that are available for them. We're hoping to change that with some information for those beginning to search for these components used in their CNC routers and other machines. 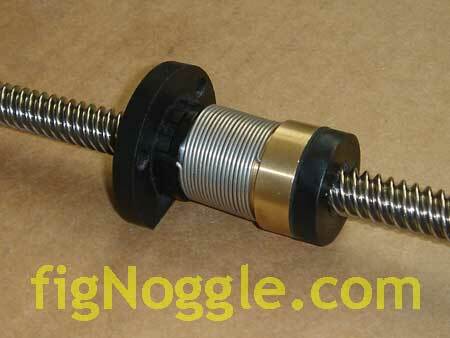 Ball screws get all the attention, but ACME leadscrews have their purpose as well. Not only are they generally less expensive than ball screws, they have more friction than ball screws which is why they are used in manual machines. Friction can be reduced with the use of different materials for the nuts (such as acetal/delrin) and/or coating the leadscrew with teflon. 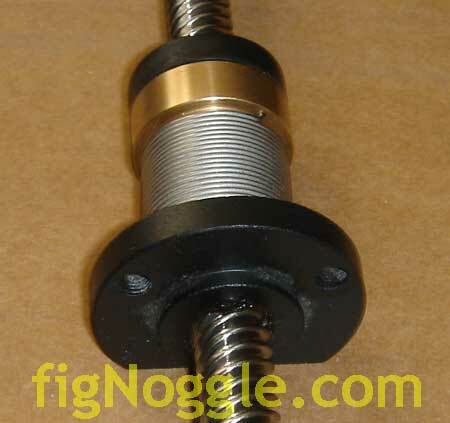 Below is a picture of a fairly high lead leadscrew that's approaching that of a spline. The nut is made of acetal with a castle-nut type configuration that has a torsion spring employed to create enough contact to reduce backlash to virtually zero. You may have seen us use 5/8" diameter 8TPI ACME leadscrews from Nook Industries with a split-nut design to reduce backlash on many of our designs. Not only is this affordable in many home shops and for those on hobbyist budgets, it's also readily available from many major catalogs such as Enco, MSC Direct, and McMaster-Carr.